It’s easy to get lost in the small details of running a business — to get caught up in the day-to-day grind. I sometimes find myself so deep in the weeds, I don’t always look at the big picture. I walked away from JL&Co’s second annual retreat/planning day earlier this week with some major revelations about the future of the business. The team (Now three people strong! Welcome, Olivia!) had the chance to celebrate our successes, reflect on our shortcomings and look toward what the future holds. It was also a huge wakeup call that some major changes need to take place if JL&Co is going to continue to grow and thrive as we move into our fourth year in business. Time for some change! 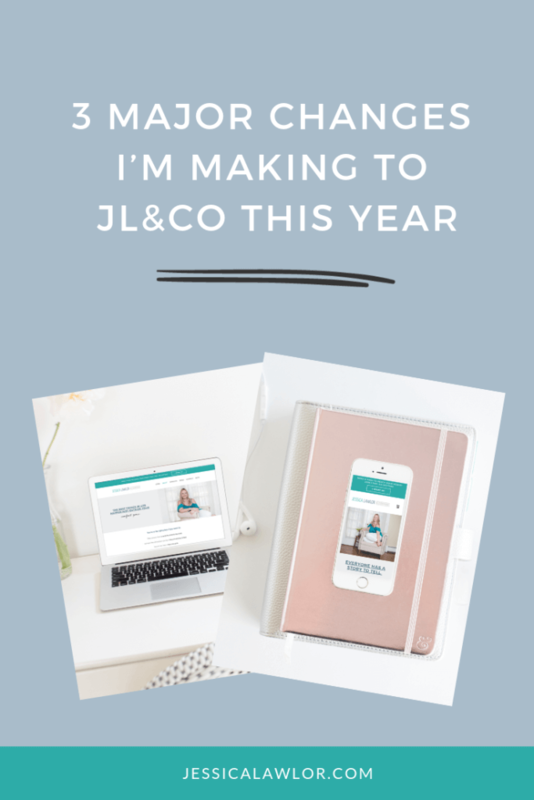 Here are three big changes I’m making to JL&Co this year. This is my motto for 2019 and beyond: Just because I can do it doesn’t mean I should do it. As the founder and CEO of JL&Co, there’s a lot more I could be doing but I’m not because I’m busy taking care of tasks that could easily be transitioned to a more than capable member of the team. At the time, it feels easier to just complete a task myself, especially if it’s something that takes 30 minutes or less. It’s no big deal, I tell myself. But it is a big deal. It’s insanely counterproductive. And it’s costing me time and money. It’s been a struggle to get out of the solopreneur mindset and into the mindset of a team leader. What’s the point of having a team if I’m not utilizing them to the fullest? After all, I chose both of my current team members because of their awesome skillsets, creativity and passion. I trust them. We’re building a training library. The whole team is utilizing Loom (my absolute favorite new tool!) to walk through and screen record tasks we complete repeatedly. (Think: how to schedule social media for Client A, how to lay out Client B’s newsletter, how to create a case study for Client C). We’re slowly building a library of videos of how to complete important tasks for our clients and the JL&Co brand. This way, when we eventually grow and bring on more team members, we’ll save time onboarding knowing that we’ve already created valuable training resources. Or, if the task needs to be re-delegated to someone else, we all have access to the same materials. Yes, this definitely might feel annoying at first, and it’s going to take time in the moment to complete, but knowing that it will seriously save time in the long run is making this project more palatable. I’m planning ahead. Like way ahead. I typically plan my to-dos and calendar week-by-week. On a Friday afternoon, I’ll sit down and take a look at the following week and draft my to-do list. This has worked well, but as the team continues to grow, I realized I need to plan my weeks much further in advance (think 2-3 weeks). This way, I can make sure I have enough time to assign and debrief action items to the team, especially knowing they work part-time for JL&Co and have other obligations. After all, it’s not fair to realize something is due on a Wednesday next week and assign it to my team on Monday morning. By looking further out into my calendar and client action items, we can work better together to smash deadlines. When I first started my business, I said yes to almost every opportunity. At the time, it wasn’t fun (and probably wasn’t the best strategy in the long-run) but I felt immense pressure to make this work, so I took on clients that weren’t always a perfect fit. As JL&Co grew and became more stable, I eventually was able to turn down those types of projects and clients, and life and work became a lot less stressful and way more fun. Interestingly, in year three of running JL&Co, I was presented with a new scenario. Now that the business is more established, I’m getting more interesting — and more lucrative — referrals and inquiries. But here’s the catch: Some of these more lucrative opportunities aren’t my ideal clients. They aren’t perfect fits, whether it’s based on the type of service they’re seeking, on an initial conversation or simply on a gut feeling. In 2018 I let myself get excited a couple of times and took on clients I probably should have immediately passed on. These mistakes were costly — both in the sense of losing actual money and in losing time and sanity. I quickly learned that I was chasing money, not chasing the right opportunities. And while money is important, and yes, I want to be profitable and continue to grow, working with the wrong clients isn’t the way to do it. I’m learning to listen to and trust my gut. If I’m being perfectly honest, I know within five minutes of talking to a prospective client on the phone if it’s going to be a fit. It’s just a gut feeling. But sometimes, I try to rationalize and negotiate with my gut — not the best strategy. I’m aiming to eliminate my scarcity mindset. Though I’ve been in business now for three years, I still sometimes fear, “This could be the last client I ever work with” or “This could be the last time a cool business asks me to help them with content.” I sometimes approach business from a scarcity mindset — meaning there isn’t enough business to go around. But there is! And it’s better to say yes to the right opportunities than to waste time and energy on the wrong ones. So this mindset needs to go — easier said than done, but I know it’s something I need to work on. I’m working on practicing patience — the right opportunities are fewer and farther between. Instead of saying yes to every opportunity, I’m working on practicing patience. I know that the right opportunities don’t come as often as other inquiries, but it’s better to have space to actually say yes to those opportunities rather than wondering how to squeeze them in because I’ve taken on other clients that maybe aren’t an ideal fit. In the long run, I’ll have better and longer lasting client relationships with the right clients, rather than onboarding and working with the wrong client for just a few months before figuring out it’s not a fit. Team JL&Co has outgrown our current processes. When it was just me, it was totally fine to operate out of multiple inboxes, content calendars and Google Drive accounts, but now that the team and our client workload has grown, things have gotten more complicated. We’re getting on Slack. It seemed silly to join Slack when there were just two of us since we mostly texted or emailed when we worked together on projects. But with a new addition to the team (and more additions in the foreseeable future), it makes sense to start using Slack now. I’ve used Slack for years with one of my content management clients, and I absolutely love how in-the-know I feel with what’s going on in their business overall. I hope my team members will feel the same way! Plus, I’m excited about building JL&Co’s culture, and I see Slack as a great way to stay connected even though we work remotely. I’m looking for the right project management tool. Time to reign in all the inboxes and Google Drives! We’re moving everything over to a project management tool to keep us organized. I asked on Twitter and got multiple recommendations that I’m vetting, though I’m leaning toward Asana at the moment because I’ve used it before and like the interface. I want to find more ways to automate parts of the business. When I worked on my website’s redesign last year, I was incredibly impressed with my designer Michaela’s amazing processes that seemed to be automated, yet still personalized to me. Signed the contract? Immediately sent a welcome email and even a sweet gift in the mail. Kickoff meeting over? Michaela sent me a Loom video walking through how to use Asana for my project. Even now that the project is complete, I’m still getting emails from Michaela to stay in touch and see how we can continue our partnership in the future. Michaela clearly set up some awesome processes upfront that are now automated but help her grow the business. This year, I want to find ways to do the same for JL&Co. Change can definitely be scary — after all, the unknown can always feel daunting. However, I’m really pumped for these three changes. These changes mean JL&Co is growing and adapting. I look forward to seeing what sort of changes I’ll need to make in the years to come as I’m sure JL&Co will dramatically change once again. Stay tuned! Next week, I’ll share the second annual State of JL&Co. I’m excited to share with you more behind-the-scenes details from retreat day and overall takeaways from our third year in business. What changes do you plan to make in your business or work life this year? I’d love to hear about them in the comments below!